How workers spent a day’s wages for an honest photographic portrait of themselves http://www.loc.gov/exhibits/treasures/trm037.html I’m interested in this history of the emergence of photography, and how workers paid for a portrait of themselves at work – a visual image that represented that identity. I created this small book as an experiment in playing with Paintshop Pro. I’ve used layers, photo manipulation, and special effects and collaged them all together. I’m hoping that this will count towards my digital imaging unit at college. of warm diesel and stale cigarette smoke. through the peeling red paint hanging in layers. 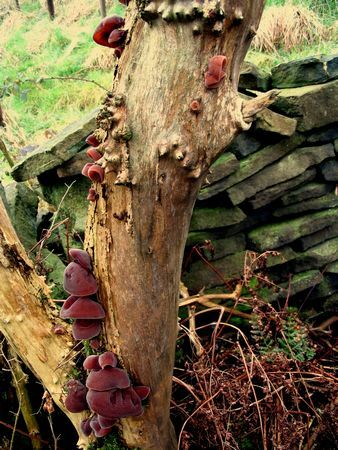 I saw this tree as we were walking up to the moors today, and was intrigued by the knobbly, almost spikey texture, and the fungi which are like folds of dark coloured flesh. It was a relief to get up to the moors. I needed to find a bit of height, fresh air and perspective, and the moors give you that. There is a standing stone on the Calderdale Way where traditionally people leave coins in the top. I usually give it a hug instead. There is something very stable, grounding and timeless about stone. Which is what I needed after a whole day yesterday spent trying to set up a wireless router. No writing done yesterday (apart from endless entering of technical stuff which definitely doesn’t count), so today I shall find out where I’ve put my ink cartridges, refill my pen and write. This term in art class, we’ve moved on to 3D. This is definitely not my forte, but it is fun to play. These are some pieces I made from clay, inspired by the idea of seeds and pods. I do love the way that clay objects show the marks of the artist who made them. I’m exhausted. We’ve been toddler visiting again. They are gorgeous, but totally draining. I have an enormous amount of respect for all parents past and present. I have no idea how you do it. Anyway, the good thing about driving North is that we get to visit Ryton Organic Gardens on the way home for their double chocolate brownie and a good dose of fresh air and inspiring gardens. The best thing is the smells – of earth, leaves, herbs, and fruit. I shall miss it when we move. Anyone know of any organic gardens in West Yorkshire? 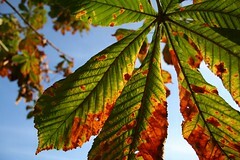 Did you know that conkers stay shinier for longer if you leave them partially in their jackets? 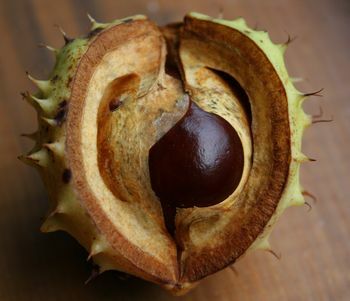 Don’t you just love shiny new conkers?